It gives me great pleasure to bring out the third edition of Advaitanavanitam of Krsnavadhuta Pandita with a summary in English. Years back when I was working at the Karnatak College, Dharwad during 1 948 to 196 1 I undertook a survey of Sanskrit Manuscripts deposited in private collections in Bombay Karnatak. In the course of this survey I came across a bunch of Manuscripts of Sri Krsnavadhuta Pandita. One of the manuscripts in this bunch was Advaitanavanitam. 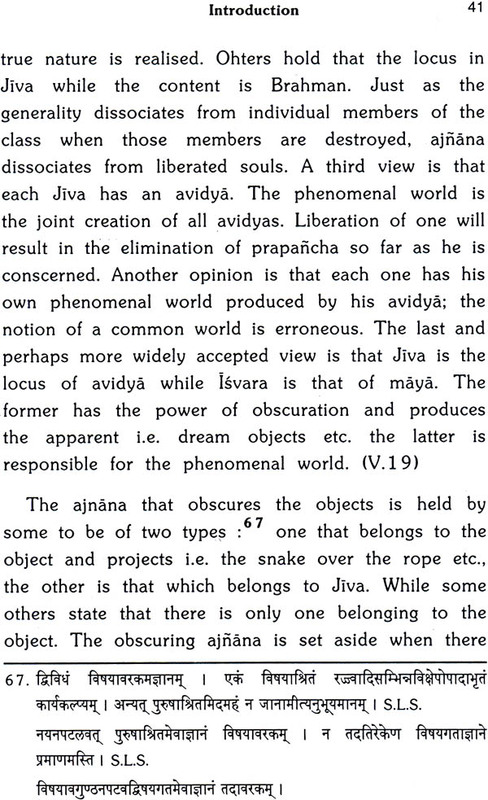 I found it to be a very lucid compendium of Advaita. I thought of editing and publishing it for the benefit of students who offer Vedanta as special subject at M.A. I mentioned this proposal to Sri Aluru Venkata Rao. To my surprise he informed me that Sri Krsnavadhuta Pandita belonged to Sondur in Bellari District. His son Sarvajfiacharya was a theosophist and his descendents are still in Hospet. I went to Hospet, contacted Sri Muddukrishnacharya, the grand son of Krsnavadhuta. He introduced me to another relative who had a biographical poem of Krsnavadhuta. He was reluctunt to give it to me on the ground that it contained some derogatory matters. However, he read out such portions that gave me necessary biographical details of this author. All this is given in the introduction to the first edition of this book and reproduced in this third edition again. 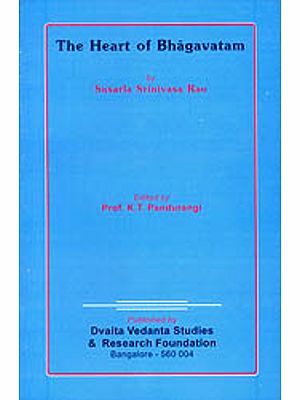 Dr. R. Nagaraja Sharma has edited and published another work of Krsnavadhuta Pandita viz. Sutramrtalahari in Madras Govt. Oriental Series. Sri Krsnavadhuta Pandita has about forty works to his credit. He has written very useful compendiums on Tarka, Vyakarana, the three schools of Vedanta and Alamkara. All these are mentioned in the introduction. Many of his works deserve publication. When the Karnatak University started its Reseach Journal in 1 957, its first editor Prof. G.S. Dixit asked me to contribute a research article. I suggested that since Advaitanavanitam is a small but very useful compendium of Advaita its critical edition may be issued in the very first number of the Journal. He kindly agreed. The University authorities also permitted me to take 500 extra copies of this book. Thus the first edition of this book was released in 1 95 7. This was out of stock around 1970 itself. 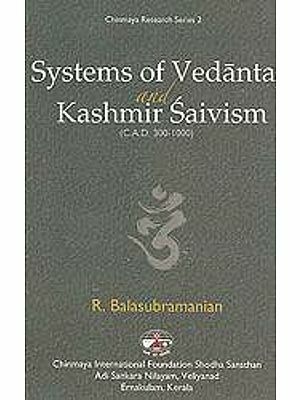 Since good many postgraduate students offering Vedanta as special subject and also teachers prevailed upon me to bring the second edition and published in 199 1. 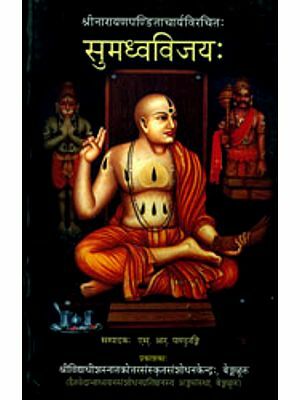 This book is especially mentioned in Dr. Pottar Bibliography of Advaita Vedanta works issued in connection with his Encyclopaedia of Indian Philosophy. Now third edition is being published. I hope this third edition will be received with the same enthusiasm with which the first and second editions were received. I take this opportunity to thank M/s. Vagartha for excellent printing. The author of Advaitanavanitam, Sri Krsnavadhuta Pandita is not for removed from us either in time or place. He lived in the last three quarters of the 19th century at Hospet near the famous historical capital of Vijayanagar Empire. Some of the works are already published. However, very little is placed before the readers about the life and works of this versatile scholar so far. The editor of one of his works i.e. Sutrarthamrtalahari has made some conjectures about our author which require revision. On the basis of the term Avadhuta in the name he infers that Krsnavadhuta must have been a member of the forth asrama. The term Avadhuta does not necessarily mean a person who has entered the fourth asrama but it refers 0 one's renunciation of worldy pursuits and devotion. In his work Ihamrgi in a personal reference, our author specifically informs us that he had a mind to enter into fourth asrama but on the advice of his preceptor he only took to the ways of Avadhuta. The second conjuncture of the editor viz., the father's name of our author was Vyasa is also not correct. The reference to Vyasa is because of the pun on the word asukavikhyata and it should not be mistaken to be a reference to his father's name. Our author himself has written a commentary on this work, and commenting on the word pita in the same verse he gives out his father's name as Bhimasena. Regarding the date of Krsnavadhuta, the editor draws our attention to the mention of Nyayasudha of Sri Jayatirtha (14th century A.DJ and Tantradipika of Sri Raghavendrattitha (17th century A.DJ and leaves the question at that. A biography of our author written by one Gurudasa in simple and lucid Sanskrit in eleven chapters is available to us. Many of the details given here are corroborated by the personal references made by our author in his works, particularly in two of his works i.e., Ihamrgi and Raghavendratantra. Sri Krsnavadhuta was born in 1835 A.D. (1 757 Saka era Manmatha Sarnvatsara) at Narayanadevarakere a village now submerged under the Tungabhadra project in the Hospet Taluk of Bellary district. His father was Venkata of Sandilya gotra and his mother Triveni. The child Krsna when three months old, was taken in adoption by one Bhimasena of Kutsasagotra, a resident of Sondur and a scholar patronised by Shivashanmukha Rao Ghorpade,' then the ruler of Sondur. After adoption Krsna was renamed as Madhva and was called Madhvakrishna or Muddukrishna. He married Radha at the age of seven. He lost his mother at the age of eleven and his father at fifteen. After the death of his parents there appears to have been a family intrigue engineered by one of his sisters viz. Sarasvati, resulting in a misunderstanding between Krishna and his wife. Attempts were also made to poison Krishna. Disgusted with the family intrigues Krishna left home and went to Mysore. His real academic career began with this incident. He acquired mastery over many branches of Sanskrit literature and undertook a tour of important centres of learning in South India. At Trivendrum by composing hundred verses within twenty-four minutes he received the title 'Ghatikasatakavi' and a golden Kanta (writing instrument). He also visited Kanchi, Arani, Tirupati, Kalahasti and other centres of learning. Persuaded by his sister Saraswati he returned home. He married a second wife Rukmini. 1 0 Till the age of thirty-two he led a life of sensuous pleasures as he himself confesses in his works. 11 But being born of austere parents and being himself a highly learned man he took to renunciation and became Avadhuta. In his later life he struggled hard to acquire spiritual power. At the age of about forty-five he had a serious attack of cholera 12 and his survival brought complete change in him. His statements regarding his spiritual attainment are as much bold as are his confessions about his earlier sinful life. He died in 1909 at the age of 74 leaving four sons one of them being the well-known theosophist of Hospet, the late S. Sarvajnacharya and two daughters behind him.